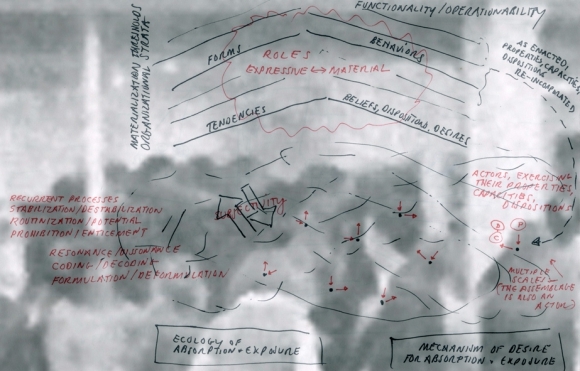 This article focuses on the new forms taken by the artistic and philosophical approach to hybrid environments in our contemporary society, more specifically in the sousveillance society. Through a presentation of American artist Jordan Crandall’s multimedia work, we will pave the way to new methods for the analysis of these complex environments, which escape the deterministic and dysphoric perspectives. We will take some of Crandall’s works and writings as a starting point, in order to introduce the sousveillance theory, as well the notions of observation, assemblage and incorporation. Based on these notions, we will rethink the relationship between the individual and environment - actual or virtual -, as well as the creativity that it induces. 1Since the mid 1990s, American artist Jordan Crandall’s writings, installations and performances have been questioning the influence of new technologies on perception and on the human body. From 1991 to 1996, Crandall directed the editorial project Blast. Taking the form of boxes devoid of any information on their content, this series of “magazines” featured various objects, as well as editable and transmutable texts. In 1997, he created multimedia installation Suspension as part of Dokumenta X in Kasselet, which focused on the way spectators transformed the actual and virtual data provided by the artist. In the late 1990s to early 2000s, Crandall worked on the strategic vision and issues of military technology. This research work resulted in his video installations Drive, Heatseeking and Trigger. His recent works—namely the text Something Is Happening (2010), the research project comprised of various writings and a performance entitled Gatherings (2011), and the text An Actor of the Street, Events, Agencies, and Gatherings (2011)—all demonstrate his interest in the interactions between individuals and their augmented environment, especially in urban crowds. 2In his works, especially the ones related to Suspension and Gatherings, Crandall researches the ways one can represent and describe the influences and dynamic exchanges occurring in an area characterized by the presence of surveillance, reconnaissance and detection technologies. Since the early 1990s, the artist has been interested in the interdependence between people and data, the latter having crept into each and every area of our daily life. Crandall points out the extent to which this interdependence affects our perception. Based on Crandall’s work, I propose to develop the idea of a perceptional state developed in response to the manipulation and standardization established by surveillance technologies. This perception cannot be achieved by avoiding, opposing or ignoring these mechanisms, but on the contrary through a complex interaction between the latter and the observer. Taking Crandall’s artistic propositions as a starting point, I will introduce some positions and theories paving the way to a reflection on the hybrid environments in which we are living. In this perspective, I will emphasize the theories of observation, sousveillance, assemblage and incorporation, which allow us to consider an alternative to the deterministic and technophobic thinking, with regards to the environments and technologies surrounding us. 3Created by Jordan Crandall in 1997, multimedia installation Suspension is founded on four conceptual principles: “Matrix concerns the structure of signification, its indissoluble links to material substrate, and its figuration of recurrences; vehicle concerns body, signification, and technological apparatus as constituted in motion, including the ways that this apparatus converts, transports, and makes its users adequate to new velocities; phoropticality concerns the augmentation of vision by technological apparatus, its manufactured mistrust of the naked eye, and its role in converting the body; and pacing regards navigational modes that are adequate to the traversal of these conversional environments, and which organize space according to patterns, rhythms, and routines.”3 Crandall implements these structuring principles of Suspension by projecting light onto small mirrors and screening videos, part of which are pre-recorded, the rest being live projections. The vehicle principle takes the form of small objects standing on a shelf and designed to be taken in one’s hand. They are prosthetic colored and numbered objects made of fiberglass, a few centimeters wide. The installation also features a book containing “figures,” images and various diagrams, as well as a website. The latter was created using VRML, a language designed to describe 3D virtual worlds and developed in 1994. At the time, VRML (Virtual Reality Markup Language) allowed Crandall to create an interactive universe that would change depending on the person using the installation computer. Crandall emphasizes the fact that there is a mutual influence between the four principles of Suspension and the person crossing the room. 4His latest project Gatherings represents the outcome of several years of research, which takes the form of texts and a reading/performance. A play in three acts lasting 60 minutes, it was presented for the first time at Berlin’s Transmediale in February 2011 and won the Vilém Flusser Theory Award. This play “blends performance art, political theater, philosophical speculation, and intimate reverie.”4 During the reading/performance, Crandall stands on the stage, in a spotlight and in front of a triple video projection. He reads a text and moves from a seat in the middle of the stage, to another seat on the left side of the stage, to a podium on the right side, always followed by the spotlight. Here, Crandall questions the relation between the individual and the crowd, as well as the highly informational environment in which this confrontation takes place. Through this project, Crandall strives to implement the observer as an individual, while taking into account the multiple influences, both human and technological, that block and push them. 5Crandall is interested in the observer’s perceptual issues, which depend on a lot of factors. The notion of observation arising from Suspension and Gatherings refers to the one theorized by Jonathan Crary. Crary refers to the first definition of the term to observe, which, according to Le Grand Robert de la langue française5, firstly means “to follow exactly, to the letter, to regularly comply with (a law, rule, obligation)…” Since 1535, the term takes on the meaning of an act of perception: “To look intently, in order to learn, to study” and “to examine, to watch (someone) carefully.” In Techniques of the Observer6, Jonathan Crary opposes the notions of observer and spectator, noting that while few dictionaries make a distinction between those two words, there is a significant difference in their etymological resonance. Spectare refers exclusively to the act of looking at something and has a passive connotation in the context of nineteenth-century culture. On the other hand, Observare implies the observer’s action. Crary emphasizes the first meaning of the term, according to which observation means conforming one’s action to rules, codes and practices. He states that “though obviously one who sees, an observer is more importantly one who sees within a prescribed set of possibilities, one who is embedded in a system of conventions and limitations.”7 These complex conditions of observation are both physiological and psychological, but also discursive, social, technological and institutional. However, observation as a perceptive act and observation as an adaptation go hand in hand. The observer is now the one who perceives within a complex system of limitations and incitements, to which they adapt—the observer and the system in which the observation takes place influencing each other. 8 Jordan Crandall, Description de Suspension, op. cit., translated by Anne Zeitz. 6In Suspension and Gatherings, Crandall analyzes how the observer develops in relation to various technologies surrounding them. In his writings related to Suspension, he describes dynamic spaces in this way: “They are accessed, ordered, and navigated under the conditions of various online and offline protocols”8. By adopting this approach, he insists on the interdependence between the observer and their environment. According to Crandall, this environment is increasingly characterized by the development of digital technologies, which strongly affect the observer’s perception and body. Jordan Crandalll, Suspension, 1997. Series of vehicles placed on a shelf in the installation. 7Talking about the principle of vehicle in his installation Suspension, Crandall directly refers to the marketing strategies implemented with a view to link the consumer’s body with commercial products. The vehicle in the mid 1990s installation, a hand-held device helping the observer, prefigures the emergence of devices such as cellphones, GPS and smart objects, and indicates the closeness of technology to the body, now become a “cyborg”9. In Gatherings, Crandall also questions the processes arising from the Internet, as well as the digital processes as a whole. In this project, Crandall defines the surveillance and detection mechanisms characterizing today’s society. In this performance/reading, he describes the functioning of credit cards, RFID chips and GPS, which influence the observer’s movements and perception. Jordan Crandall, Gatherings, 2011. Images taken from the performance/reading projection. 9This is how Crandall explains his interest in tracking mechanisms, which rely on algorithmic procedures and automated systems: “I explore how technologies of tracking have been incorporated into distributed network environments—augmented by new sensing and locationing technologies and embedded into mobile devices, buildings, cars, and urban infrastructures.”11 However, Gatherings cannot be reduced to the implementation of processes to adapt to the technologies determining insidious sousveillance. On the contrary, Crandall focuses on the possibilities a subject confronted with a complex network of sur- and sousveillance is provided with. According to Crandall, analyzing the networks of powers surrounding us is crucial, while simultaneously focusing on the subject taking action within those networks. Jordan Crandall, Suspension, « plan », 1997. 12 Edgar Allan Poe, The Man of the Crowd, 1840. 10In order to picture the link between the sur- and sousveillance processes and the individual, Crandall updates in Gatherings, as well as in An Actor of the Street, the figure of “The man of the crowd” described by Edgar Allan Poe. In Poe’s short story, this figure of The Man of the Crowd12 is associated with the changing 20th-century urban landscape. In this 1840 short story, a man is sitting in a coffee-house, peering into the street beyond the window. After a while, an old man in the crowd catches the eye of the observer. As the observer feels the urge to know more about him, he decides to follow him. However, he fails to learn anything about this enigmatic character, even after he tailed the wandering man, endlessly roaming the streets this night and the next morning. 11In the cultural context of the 20th and 21st centuries, Gatherings describes and substantiates the interaction between the individual and the urban crowd, between the individual and the everflowing environment that pursues and “captures” them. In this way, he transposes onto contemporary society the curiosity felt by Poe’s character in the coffee-house and during his “chase.” Like Poe’s short story, Gatherings starts with a man observing the crowd passing by him. Nevertheless, Crandall complements this observation with a security officer watching this street scene, as well as an automated video system targeting this same character. The observer leaves his observation post and follows the wandering man, just like Poe’s character. Crandall draws a link between detection technologies and the observation modes physically and psychologically involving the observer in the observed scene. Jordan Crandall, Gatherings, 2011. 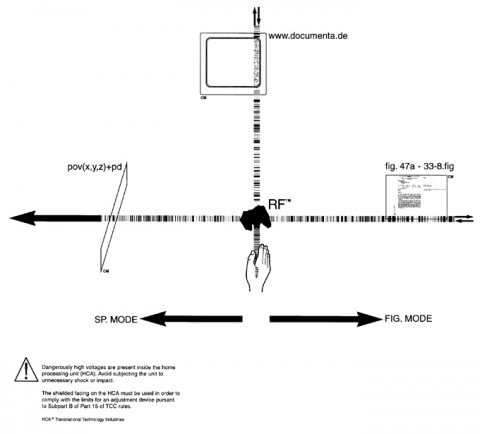 Recording of the performance/reading during Berlin’s Transmediale in 2011. 16 Manuel DeLanda translates Deleuze’s term agencement into the English word assemblage. 19 Jordan Crandall, “An Actor of the Street,” op. cit., p. 61. 13According to Crandall, the way urban “actors” respond to detection mechanisms influence them. Subsequently, the interaction that takes place results in an endless transformation of both the observer and their environment. As described by Deborah Hauptmann14, Crandall confronts us with augmented environments “within which both human and machinic agency interact, interoperate, inter-immerse.”15 In order to account for the dynamic that links the observer to their environment, the structure of Gatherings derives from the “assemblage theory”16 formulated by American philosopher Manuel DeLanda’s17. The assemblage theory developed by DeLanda in A New Philosophy of Society, Assemblage Theory and Social Complexity18 originates from the writings of Gilles Deleuze and Félix Guattari. For DeLanda, Deleuze’s notion of agencement indicates first and foremost the relation between a part and a whole within a complex network. The assemblage theory thus represents a starting point for the study of complex social facts, while focusing on individuals. In A New Philosophy of Society, DeLanda explains and develops the assemblage theory. According to his minimal definition, assemblage is an ensemble made up of irreducible and heterogeneous elements that can be broken down. It is irreducible in the sense that it develops “emerging properties,” or in other words that the properties are not solely defined by the sum of the properties of the involved elements. Besides, it can be broken down, since the elements do not merge within the assemblage, but can be reintroduced in new assemblages. According to DeLanda, the approach adopted by the assemblage theory allows for a concrete analysis of social realities at various levels. In Gatherings, Crandall tries to apply DeLanda’s theories to the observation mechanisms. He is interested in the way the individual moves depending on the infrastructure surrounding them, but also depending on the other “actors” of the urban environment. The observer’s practice cannot be separated from their environment, yet it can be analyzed within the relations involving them. This practice constitutes an action, according to Crandall, and “action is a modulation”19 implemented in dynamic situations. 20 Jordan Crandall, extract from the text of the performance Gatherings, op. cit. 15Crandall shares this view of the observer’s body, whose interrelated potential movements and perceptions must be taken into account. For Massumi, the notion of motion is related to the idea of a body in constant mutation: “When a body is in motion, it does not coincide with itself. It coincides with its own transition: its own variation.”23 Consequently, Massumi develops a theory considering the human body as caught in immediate relations and potentially undergoing variations and transformations. However, by nature, this body is also a body that “feels.” By adopting this approach, Massumi paves the way for an analysis of daily acts of resistance manifesting themselves through perceptual modes and physical and physiological sensations. 16While Crandall refers several times to the image of the crossing or walking in order to visualize the act of observing, he defines this action as an “embodied practice.” This practice depends on the interaction between the observer and their environment. David Howes analyzes embodiment in relation with perception and distinguishes this notion from that of emplacement, which according to him, makes the former more complex: “While the embodiment paradigm implies an integration of the mind and body, the paradigm resulting from emplacement suggests a reciprocal and sensual relation between body-mind-environment”24, in which environment is considered both in the physical and social sense of the word. For Howes, emplacement refers to a rich perception of oneself in relation with the environment and is thus opposite to a feeling of displacement. Crandall’s embodied practice must be understood in this sense, which structures the observer within a complex and dynamic network and gives them a sense of belonging to this network. Jordan Crandall, diagrammes, Gatherings, 2011. 18Embodiment is a subtler process. It consists of “strategies through which human life combines with and assimilates the grids and rhythms of everchanging, minimal concrete historical contexts in which they occur.”27 It is in this sense that the movements of man across the city are presented by Crandall as an embodiment action. According to Crary and Kwinter, embodiment is the practical relation the individual has with their environment and through which they “adapt” to and “retain” specific effects. For Jonathan Crary, the notion of embodiment allows for a dual notion of the body, which thus becomes both the subject of the operations of power and the subject of potential resistance. 29 Jordan Crandall, “Something Is Happening,” op. cit. 30 David Howes, “Introduction,” op. cit., p. 9. 31 Jordan Crandall, “Something Is Happening,” op. cit. 20In Crandall’s writings, this “observation of observations” involves all the senses. “Absorbed in the gathering, I feel the sweat of the man next to me, his heartbeat, his anxious pleasure. I feel someone’s hot breath against my skin. a vibration passes through me, which could become a murmur”29, one can read in Something Is Happening. In his introduction to Empire of the Senses, David Howes insists on this “intersensoriality,” “the multidirectional interaction of the senses and sensorial ideologies, whether they are regarded in relation with society, an individual or a work.”30 As early as Suspension, Jordan Crandall has constantly highlighted the importance of intersensoriality: “to focus on visual codes and miss them.”31 Touch, smell, hearing and sight, through their interdependence, all contribute to shaping observation experiences. Jordan Crandall, diagramme, Gatherings, 2011. 22It is through this constantly vacillating perception that the observer establishes a link with the people and infrastructures surrounding him/her, while distinguishing him/herself from them. Crandall’s observer responds to the multiple influences of their environment through multi-sensorial perception, which simultaneously absorbs and isolates them. For Crandall, every perception is thus linked to the notion of loss of oneself, going together with a feeling of enrichment. 23The observation described by Jordan falls within a reflection initiated about twenty years ago by the artist on the transformations induced by digital technologies. In order to respond to the developments of surveillance, reconnaissance and tracking, it is crucial that new methods are found for the analysis of highly informational environments with which we are confronted today. Crandall’s works pave the way for a new form of analysis of this complexity by taking as a starting point the subject as a subject of action. Crandall drops all deterministic vision, while showing the issues of the technologies affecting our movements and perceptions. In this way, his work manages to reveal the inherent creativity of our daily perceptual practices in front of a society pervaded by sur- and sousveillance technologies. Crandall Jordan, “An Actor of the Street, Events, Agencies, and Gatherings,” SubStance, vol.40, #3, 2011. Crandall Jordan et Zeitz Anne, “Observational Practices: A Conversation with Jordan Crandall on Rhythm, Pace and Crowd Interaction,” in Samuel Bianchini et Erik Verhagen (ed. ), Practicable. From Participation to Interaction in Contemporary Art, Cambridge, The MIT Press, 2016. Crandall Jordan, Description of Suspension on the artist’s website. [Source] http://jordancrandall.com/main/+SUSPENSION/ [accessed 8 septembre 2015]. Crandall Jordan, Description of Gatherings on the artist’s website. [Source] http://jordancrandall.com/main/+GATHERINGS/index.html [consulté le 8 septembre 2015]. Crandall Jordan, Extract from the text of the performance Gatherings, 2011. [Source] http://www.transmediale.de/de/node/16888 [accessed 8 septembre 2015]. Crandall Jordan, “Something Is Happening,” CTheory, 2010. [Source] http://www.ctheory.net/articles.aspx?id=637 [accessed 8 septembre 2015]. Crary Jonathan, Techniques of the Observer. On Vision and Modernity in the Nineteenth Century, Massachusetts Institute of Technology, 1990. Crary Jonathan et Kwinter Sanford, “Foreword,” in Jonathan Crary et Sanford Kwinter (eds. ), Incorporations, Zone 6, New York, Urzone, 1992. DeLanda Manuel, A New Philosophy of Society: Assemblage Theory and Social Complexity, London/New York, Continuum, 2006. DeLanda Manuel, Assemblage Theory, Society, and Deleuze, enregistrement d’un séminaire de 2011. [Source] http://www.youtube.com/watch?v=J-I5e7ixw78 [accessed 8 septembre 2015]. Haraway Donna J., Simians, Cyborgs and Women: The Reinvention of Nature, London/New York, Routledge/Free Association Books, 1991. Hauptmann Deborah, “Introduction, Architecture & Mind in the Age of Communication and Information,” in Hauptmann Deborah et Neidich Warren (eds. ), Cognitive Architecture, From Biopolitics to Noopolitics, Architecture & Mindin the Age of Communication and Information, Rotterdam, 010 Publishers, 2010. Howes David, “Introduction,” in Howes David (ed. ), Empire of the Senses. The Sensual Cultural Reader, Oxford/New York, Berg, 2005. Massumi Brian, Parables for the Virtual, Movement, Affect, Sensation, Durham/London, Duke University Press, 2002. Poe, Edgar Allan, The Man of the Crowd, 1840. Quessada Dominique, “De la sousveillance. La surveillance globale, un nouveau mode de gouvernementalité,” Multitudes, n° 40, Winter 2010. Valéry Paul, “Poetry and Abstract Thought” , The American Poetry Review, March/April 2007. Le Grand Robert de la langue française, t. 4, 2d édition, directed by Alain Rey, Paris, Dictionnaires Le Robert, 2001. 1 Paul Valéry, “Poetry and abstract thought” , in The American Poetry Review, March/April 2007, p. 62. 2 Jordan Crandall, “An Actor of the Street, Events, Agencies, and Gatherings,” SubStance, vol. 40, #3, 2011, p. 53. 3 Jordan Crandall, Description of Suspension on the artist’s website. [Internet source] http://jordancrandall.com/main/+SUSPENSION/, accessed 8 September 2015. 4 Jordan Crandall, description of Gatherings on the artist’s website. [Internet source] http://jordancrandall.com/main/+GATHERINGS/index.html, accessed 8 September 2015, tr. AZ. 5 Le Grand Robert de la langue française, t. 4, 2e édition, dirigée par Alain Rey, Paris, Dictionnaire Le Robert, 2001, p. 2064-2065. 6 Jonathan Crary, Techniques of the Observer. On Vision and Modernity in the Nineteenth Century, Massachusetts Institute of Technology, 1990. 9 Donna J. Haraway, Simians, Cyborgs and Women: The Reinvention of Nature, New York: Routledge, and London: Free Association Books, 1991. 10 Dominique Quessada, “De la sousveillance. La surveillance globale, un nouveau mode de gouvernementalité,” Multitudes, no. 40, Winter 2010, p. 54. 11 Jordan Crandall, extract from the text of the performance Gatherings, 2011. [Internet source] http://www.transmediale.de/de/node/16888, accessed 8 September 2015. 14 Deborah Hauptmann, “Introduction, Architecture & Mind in the Age of Communication and Information,” in Deborah Hauptmann, Warren Neidich (eds. ), Cognitive Architecture. From Biopolitics to Noopolitics, Architecture & Mind in the Age of Communication and Information, Rotterdam, 010 Publishers, 2010. 17 Manuel DeLanda, A New Philosophy of Society: Assemblage Theory and Social Complexity, London/New York, Continuum, 2006. 18 Manuel DeLanda, Assemblage Theory, Society, and Deleuze, Recording of a 2011 seminar. [Internet source] http://www.youtube.com/watch?v=J-I5e7ixw78, accessed 14 March 2014. 21 Brian Massumi, Parables for the Virtual. Movement, Affect, Sensation, Durham/London, Duke University Press, 2002. 24 David Howes, “Introduction,” in David Howes (ed. ), Empire of the Senses. The Sensual Cultural Reader, Oxford/New York, Berg, 2005, p. 7. 25 Jonathan Crary and Sanford Kwinter, “Foreword,” in Jonathan Crary and Sanford Kwinter (eds. ), Incorporations. Zone 6, New York, Urzone, 1992. 28 Jordan Crandall, “Something Is Happening,” CTheory, 2010. Internet source: http://www.ctheory.net/articles.aspx?id=637, accessed 8 September 2015. Anne Zeitz is associate professor at Rennes 2 University. Her research mainly focuses on surveillance and “sousveillance” theories, notions of attention and observations as well as descriptions and practices of counter-surveillance in contemporary art, literature and cinema. (Paris 8/2014). She organized the project Movement-observation-control fort the Goethe Institute in Paris, collaborated with the Goethe Institute in Johannesburg and was a member of the Observatory of New Media. She is currently taking part in the research project “La Fabrique des arts sonores” and Urban Encounters/Tate Britain (2014-2015). She is associated with the research laboratory TEAMeD and she was postdoctoral student at the Labex Arts-H2H/Paris 8 in 2015/2016.